No time to blog, I've been working off and on all weekend, and need to leave for the office. Have a nice Monday, though! Day 861 - Funny photo! Look at this funny little face and flower-power outfit! Love it, love it, love it! 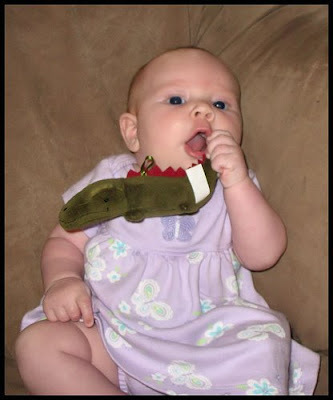 I think this is the first picture I've seen of her biting her fingers. I had a pleasant day yesterday swimming, sunning and shopping. Today Charlie and I plan to go swim early, then go to a 9:45am movie matinee. Yes, I have written that correctly - 9:45am. I LOVE those early morning movie matinees, because we have the whole rest of the day to enjoy after that. We plan to go see that new movie 'Wanted', with Angelina Jolie. Looks pretty action-packed. We'll get out at lunchtime and maybe have lunch out - haven't discussed that yet. Day 860 - Berry Berry Good! Well, I've been up since 3:30 working on a problem at work, so I thought I'd write the blog before I go back to bed. This photo is a little dark, but all those big pans of 'dark things' are actually fresh BLACKBERRIES that Charlie picked yesterday! 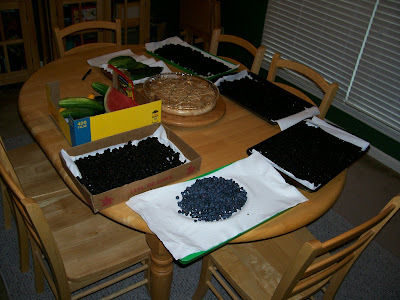 Yes, there are also piles of blueberries, cucumbers, and squash from the garden. What bounty! Charlie - I can't say THANK YOU enough! Thank you, thank you. I know that this represents HOURS of work. Charlie is sporting a sunburn on both shoulders as a result. We haven't had any blackberry harvest in TWO YEARS due to droughts. Can you tell I'm excited about it?? We ate some fresh, gave some to TY and SY, and I froze the rest for jam packed in vacuum sealer bags. We'll see if they stay free of freezer burn. That means I can throw away some berries from 2003 and 2004 that I still have in the freezer! Day 859 - Ride em', cowgirl! 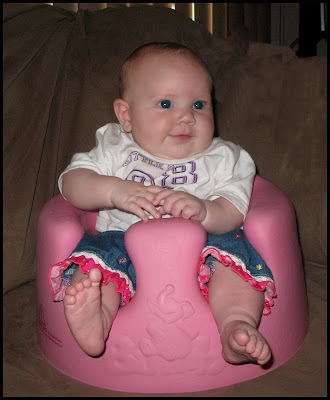 Here's Miss Savannah in her Bumbo seat - she looks like she's on a riding toy rather than in a seat! Remember when 'Big Wheels' came out? 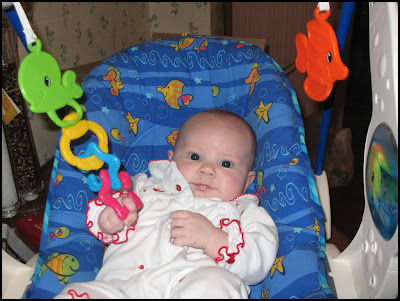 They were the most popular riding toy when Heather and Evan were small. Nowadays kids have battery powered cars that move by themselves! It's better to get ones they have to pedal so they get exercise in the process! I dreamed about crispy pizza last night - is there a deeper meaning or hidden significance to that? Probably not! I had some other dreams (one was in a snowy area that had a state park and trails) but can't remember enough of them to write them down. Charlie and I went to Applebees for supper last night (I didn't feel like cooking), and it was really good. I get a quesadilla for my entree, and a side salad, and it is just a perfect dinner. Charlie had steak with portabello mushrooms. Weekend plans - just swimming and shopping as usual - which suits me just fine. 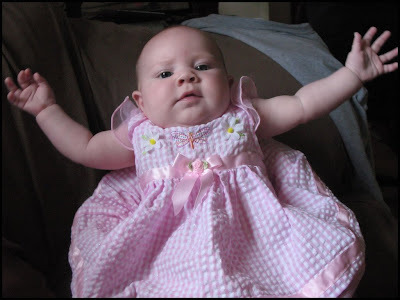 Look at this adorable girl, wanting to be picked up - and look at the darling little dress she is in! 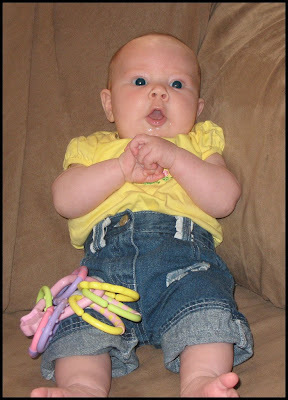 The lovely thing about having a little girl is how CUTE they look in all their outfits! I don't think I've seen Savannah in the same outfit twice... well... maybe one time. Wait till she wants to be a princess, and a fairy, and a bride, and play dress up with all sorts of outfits, and try on makeup. Then later, she'll wear makeup, and want to color her hair, and want piercings (who knows) and tattoos and a cell phone and a car and an allowance! Day 857 - Take me home, it's half past wine thirty! 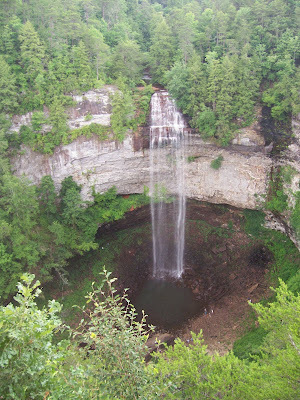 Here is a photo of the main attraction at Fall Creek Falls. See those 'specks' at the bottom of the falls? Those are PEOPLE. Click on the photo to make it bigger, by the way. As I was saying yesterday, we had a wonderful day of sightseeing and hiking, went to the nature center, had snacks at a picnic table, etc. When we were almost back to the condo, we detoured a bit to go find some fishing lakes near where we were staying. Our detour took longer than we thought it would. The map was poor, the scale was wrong. We got worried about our gas supply and stopped for gas. We couldn't find one of the roads that led back to a beach, even though we could SEE it from a distance. Anyway - before too long, there was some serious whining (pleading) going on to go home for happy hour. 'It's half-past wine thirty!' declared Charlie. We all agreed. It was time to go in for the night. We didn't even play cards or dominos, just relaxed from that point on. Monday is over with - that's a relief. Here is a great photo of a section of one of the trails at Fall Creek Falls. 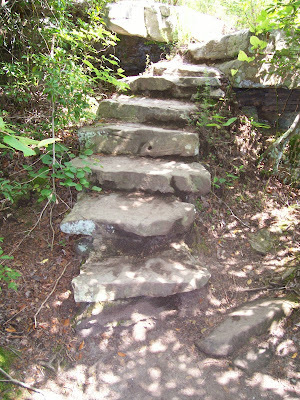 There are a lot of 'natural' (or perhaps park facilitated) stone stairways you navigate to get to the various overlooks. Thankfully my knees weren't sore the next day from all the 'stairs' - thanks, water aerobics! There are also suspended bridges on some of the trails that cross over the streams. These sway and bounce as you walk across them - the kids scream and it is not easily done without holding the rail! My striped Champion sneakers caught the attention of a matronly woman sitting on a bench - she said I could have sold 100 pair of them to all the people who wanted more comfortable shoes in the park! Another time Charlie and I were there - we took the trail (can't remember the name) that starts at the back of the nature center and winds around through the woods. It's a pretty rugged trail, and people come back from it pretty tired. We stopped about halfway through our hike at an open, rocky area to rest and have some water. There was another couple there - a pregnant woman and her husband. Her husband informed us that his wife had had enough of the hike, and he was just looking for a way to get her out of there. Alas - they were about at midpoint, and there wasn't another way out. The moral of the story is - be prepared - there often isn't a way back except the way you came! Day 855 - Monday again! We weren't home this weekend, but my blogs kept publishing because I wrote them in advance and put a date and time on them for when they would be available. Isn't that cool? 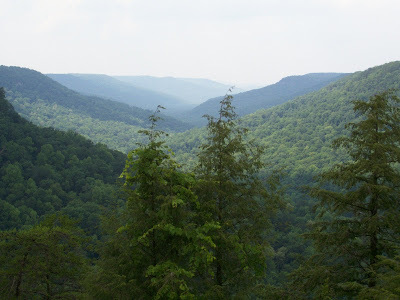 This lovely picture was taken on Saturday at Fall Creek Falls State Park. The overlook is named 'Buzzards Roost'. We spent a lovely day there, and a lot of people were using the rock quarries as natural swimming holes - I was kind of surprised that people still do that! I have more pictures to post over the next few days - so stay tuned and have a nice Monday! As seen on a church sign on my way to work ' Get your Free Ticket to Heaven'. Stop looking... I'm not writing anything substantial this weekend. I'm trying to enjoy my weekend, away from the computer. Hello, out there, Bloggy land! No time for bloggage - please talk quietly amongst yourselves in the comments. While I am having fun elsewhere, maybe I'll be wishing I had time to hang around typing on the computer. Day 852 - Friday, Hooray! 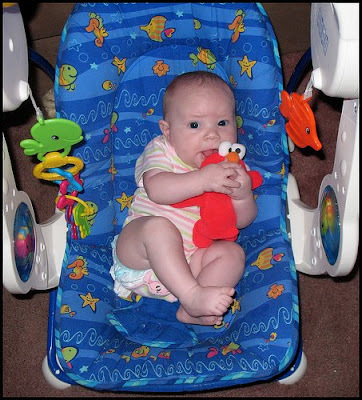 Look, even Savannah is happy it's friday, she is squeezing Elmo till he's bug-eyed. Have you ever eaten stone ground corn chips or tortillas that were so grainy or full of fiber that they cut your mouth and make it sore? Last night, for example, I was beaten up by some multi-grain tortilla chips. That makes me pretty wimpy if you ask me. It makes me wonder if I am allergic to something in them. They have all sorts of seeds in them too. Gotta Go! TTFN and have a nice weekend! Day 851 - Thursday - or is it? We are having a cold snap - it is only 54 degrees this morning, high of 83 expected with low humidity. 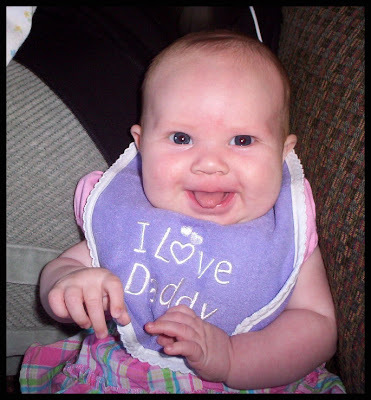 Here is Savannah - experiencing the wonders of baby cereal. We had a blood drive at work yesterday. If you have ever been to donate, they ask you a series of questions to see if you are a candidate for giving blood. They have added a new question that they ask you early in the process. THEY CONFIRM YOUR GENDER by asking you if you are a male or a female! I guess it must be hard to tell nowadays!!! The interviewer asked me my name, address etc. Then she asked if I am a female. I said 'Now THAT's a new question' and she said 'Yes, it is'. Yes, I told her the truth, I am a female. I don't know what it is for - but it was certainly food for conversation yesterday! 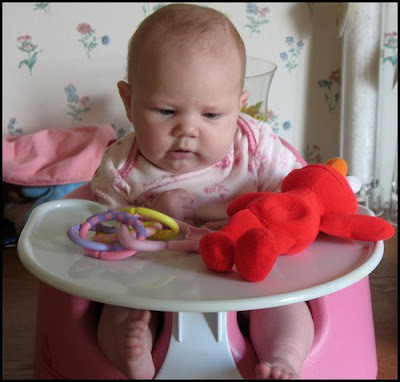 Look at this adorable girl with her Bumpo sitter and tray! 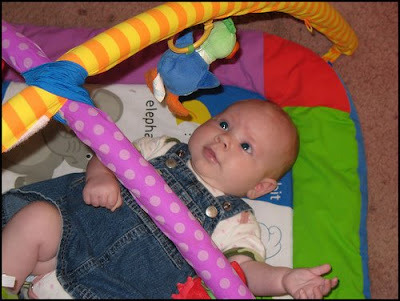 Now she has a play surface she can reach, without waiting till she's older and in a high chair. Heather - any updates on her hair color? Still looks on the strawberry side to me! I had a very draining day yesterday, and my blackberry isn't working right so it hasn't updated my mail since yesterday. Don't know whassup with that. Mr. Charlie is going fishing today, and shooting tomorrow. Did I think he was going to spend all his time on yard work?? Speaking of yard work - he is loving his new lawn mower, he flies around the yard like a race car driver. The lawn mower has a speed pedal similar to a car, so he can back off on the gas to slow down around trees and shrubs without shifting to another gear. He really likes it. Day 849 - Cereal, anyone? Look, our darling Savannah tried baby cereal for the first time yesterday. She looks perplexed. Heather laughed about how excited I was to hear about it - it was MUCH more exciting than my day at work! 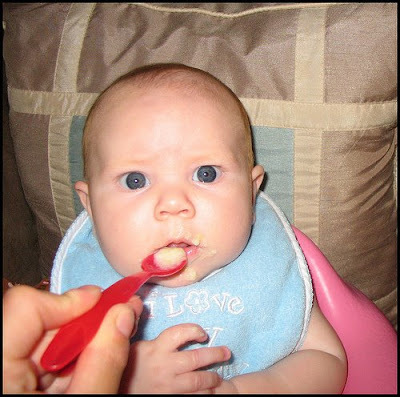 Heather and Evan loved rice cereal with applesauce (or pears or peaches) in it more than anything. I wonder what baby food costs nowadays? Do they sell it at Sams Club? 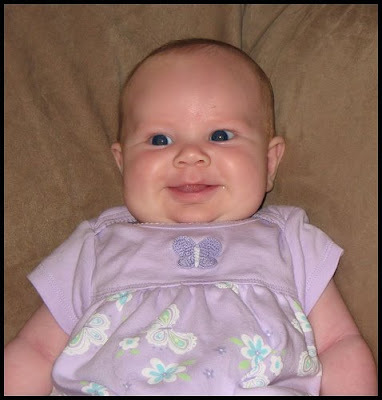 I remember someone who would use baby food jars for gift bottles and party favors. Look on the web for what you can make from them. (or, throw them out and ignore all this babble). Charlie, myself, TY and SY had a nice dinner out to try the Monday night special at Logans Roadhouse. Actually, the special is all day Mondays and Tuesdays - two meals for $13.99. Charlie had tilapia, cole slaw and loaded mashed potatoes, and I had a 6oz sirloin, a baked sweet potato, and a side salad. It was a great deal for the price. 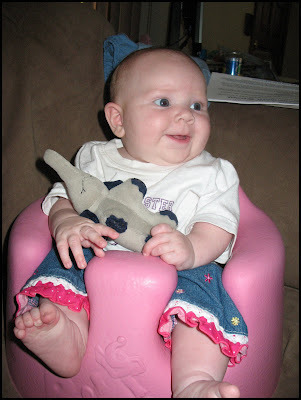 Here is another cute photo of Miss Savannah in her Bumbo seat, playing with a little elephant. I have a very important question this morning. I fray the very end of my toothbrush, even shortly after it is new. Do you? What am I doing wrong? Brushing too hard? I dropped the soap (with a crash) in the shower this morning. I told Charlie I couldn't go to work because I have 'post traumatic soap disorder'. Ha! I know, I know - lame as lame can be. We had a nice Fathers Day weekend. Yesterday we went to work out in the morning, then had lunch, then went to see the movie 'The Happening', which was a disappointment. Good idea, poor story. We went to Chilis after that for happy hour - mini cheeseburgers and mango margaritas for me -yum, then back home. Day 847 - Happy Fathers Day! Just a quick note to say 'Happy Fathers Day' to all the Daddy-o's out there. TTFN - gotta go swim, and Charlie and I will hit a movie later today for Fathers Day. 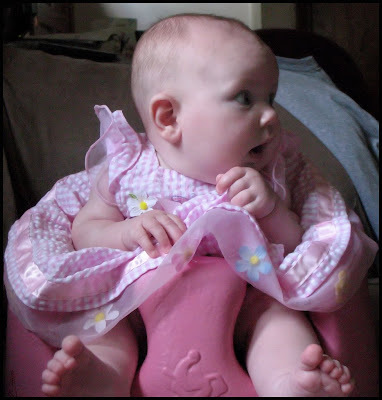 Here is Miss Savannah, sitting in her new Bumbo Baby Sitter that arrived this week, compliments of Grammy Gigi (that would be me). 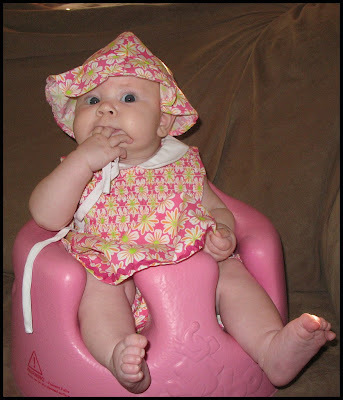 The cool thing about this seat is that a baby can sit upright in it (like an older child) before they are sitting up by themselves. You can take it anywhere, and it even comes with a tray so you can use it like a booster seat and high chair combined. She looks so cute and adorable, I just want to squeeze her!!!! AAAAAARrrrrgghhh!!! Have a nice Saturday, I'm going to water aerobics this morning and Charlie is going to a 'bee event'. I was already on the computer researching a problem at work (turned out to be a non-problem) so I'll write a quick blog and then go get ready for work. Yes, I've used this photo once before, but it is so priceless I have to post it again. Charlie's bee sting puffiness is substantially better this morning, but still not 'all better'. That was a very bad bee with some very potent venom. This morning I picked a tick off Charlie's leg - he is attracting all sorts of trouble, isn't he? Gotta go - sorry for the short blog - Happy Friday and Happy Fathers Day weekend! Hey! I know why I had a phantom issue this morning - it's Friday the 13th! Be careful today! Day 844 - Is today Thursday? Good Morning, "Sure Happy It's Thursday-ers"! (look at the initials). It doesn't 'feel' like Thursday to me, more like Wednesday I guess. Another hot day expected, 92 in the afternoon. Mr. Charlie is still puffy this morning on one side of his face from that bee sting, but it looks a little better around his eye. Poor thing! I hope the newspaper has all it's parts this morning... It hasn't arrived yet. Hey, I need to run, I haven't even combed out my hair yet. Day 843 - Tres Chic or Tres Sheikh? 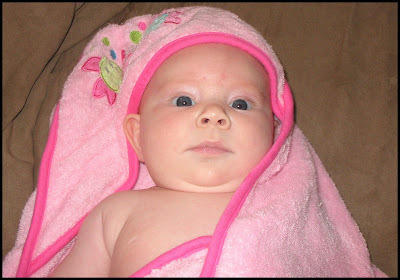 Here she is, Savi El Baba, Queen of the Bath, ruler of land and sea! Charlie is having a rough morning this morning. He got stung on the face yesterday by one of his bees when he was showing them to his brother. That side of his face is all puffy. Strike one. Then the paper arrived and one section (his favorite) was missing out of it. Strike two. He is leaving soon to go fishing with his friend TY, and needs to 'face' other people today, pick up some parts, etc. Strike three. 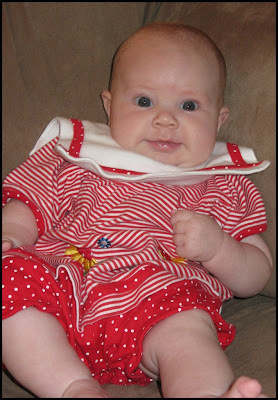 Look at darling Miss Savannah in her red and white sailor suit! Adorable! 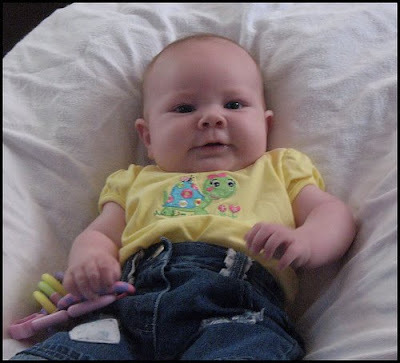 Heather - she is just too cute. Mail her to me! I made it through Monday and left work on time. I went to the health club for a swim in the outdoor pool. The water temperature outside is very warm now after all these days in the 90's. I saw something new yesterday - a 'Polo' brand Baby Bear beach towel for a KID - nothing like a $50 (or more) towel to dry your wet little darling. Speaking of hot - it is 6am and the air conditioning just kicked on. Hot Hot Hot. Not much else going on - Charlie and his brother are going to fix a loose shingle on the roof this morning. Be careful! No decisions yet on a new riding mower. Stay tuned for more exciting news (yawn) from the home front! Here is darling Miss Savannah, looking like she is in charge, as usual. I haven't mentioned that our 10 year old riding lawn mower blew an engine on Saturday. Charlie and I went to three places yesterday to look at new ones. There are even lawn mowers now with cruise control, cup holders, all sorts of options. We looked at a Club Cadet mower with a sign on it that said 'automatic deck wash feature' or something like that. Charlie and I have already been up, had breakfast, been to the health club, come back, and I have laundry in the washer. We are finally getting around to reading the Sunday paper. I'll make this short, but Hi and Happy Sunday! Just a quick note before I go 'do my Saturday thing' - water aerobics and shopping and such. K: If there isn't, there's another package in the freezer. C: I don't know where to find anything in the freezer. K: There is a leftover whole chicken in the fridge, you can use meat from that to make a sandwich if there isn't any lunch meat. C: There isn't enough left for a sandwich. K: So why is it still IN THERE? Ha! Have a nice Saturday and TTFN! Day 838 - Friday, Hooray! It's that time of the week again - beautiful, wonderful Friday! Can you say 'Friday', Savannah? Any day now, I'm sure she will. We've had three 90 degree days in a row, and the house feels hot and humid even with the air conditioning. I needed to put away laundry from last night that I had thrown over the back of the sofa to keep from wrinkling (due to falling asleep and not finishing the wash). Complain complain - if you don't have anything nice to say, don't say anything. Okay - I'll say this. TTFN and have a nice Friday! Cute picture, Heather! Savannah sure looks like she's ready to chew on something. 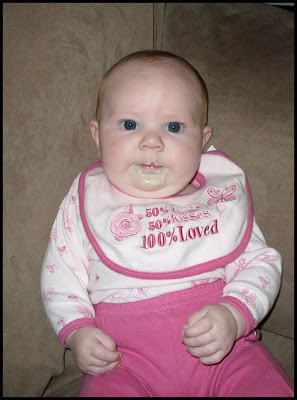 Try a little baby applesauce on her hand, it might taste better than toys. Charlie is back from a couple days away in Alabama. Fan Fair is in town this week and it is going to be BLISTERINGLY hot. Mid 90s and no shade. I am not interested at all in being part of that heat-fest! It's called the CMA Festival now - does that stand for 'Cooking My A$$' off? Ha! Better go make my lunch - have a nice Thursday! TTFN! 'Oh My! ', said Savannah - it's Wednesday! What a cute face! 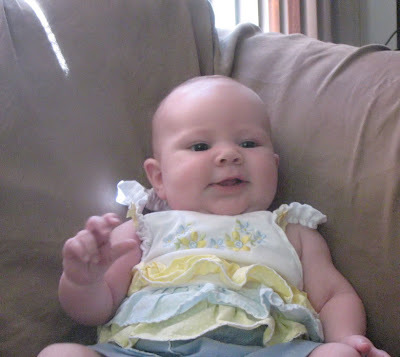 I can't believe all the expressiveness she has at only three months. It's actually Tuesday night but I am going to blog tonight and sleep late in the morning - doesn't that sound GOOOOD?? A couple was hosting several little girls for a slumber party. They have an 8 year old and a much younger daughter. The hostess (a.k.a. ' the Mom') normally doesn't close the door when she is in the master bath, but due to 'company in the house', she did that day. When she shut the door, what did she see? Her younger daughter had taken 'Moms' very reddest lipstick, and KISSED THE WALL in a perfect line behind the door where you couldn't see it. My water aerobics instructor said she didn't even wash it off, she thought it was so cute! Update from Karen on Wednesday - when I got up and viewed the blog, Blogger had screwed up the spacing between lines so I had to fix it - THREE TIMES. Bye! Day 835 - Twofer Tuesday! I left work yesterday at lunchtime to make up for my weekend work and had a very nice afternoon all to myself. I went to the health club, and my timing coincided with a lifeguard training class session. I watched the pool director 'drown' over and over again and the various students (mostly teenagers by the look of them) practice their lifesaving skills. I remarked as one of the water aerobics instructors walked by 'I didn't know they were showing Baywatch in here'. He got a laugh out of that. The ratio of males to females in the class was maybe 3 to 1 - I don't know if that's typical. I did wonder why only ONE of the female students had the sense to wear a one piece swimsuit to their lifesaving class. Do the others think a two piece swimsuit is going to STAY ON during a real rescue??? Oh right - teenaged girls don't think, it's true. Here is little Miss three month old Savannah, encouraging you to get up and go to work. She looks adorable, as usual! I went swimming yesterday morning, then to an early matinee to see 'Prince Caspian'. I enjoyed Prince Caspian, but they borrowed a bit from LOTR if you ask me. I spent the rest of the day and evening and some of the overnight working. Joy of joys. We're OK now though. Take care and have a nice Monday! Day 833 - Hello, gotta go! No time to blog at the moment, we had the computer turned off due to thunderstorms, and now I have a wash in and am leaving for the health club. We saw 'Indiana Jones' yesterday and enjoyed it, not quite as much as the earlier ones, but it was worth the matinee price which has increased to $6.75. Happy June and Happy Belated birthday to my sister in law!